The card has a $10.00 value and is only redeemable for products purchased from you. It can not be used for sales tax, shipping cost, cash or refund. Our cards are much more economical than similar gift cards, costing you less than 30 cents each! The top portion of the back of the card is designed for you to place your personal information sticker. Studies show this card will not be thrown away. The Basic Gift Card - Let people know you have $10 Gift Cards available that they can purchase for gifts. "How many would you like?" Warm Chatter Bookings - "I would like to introduce my business to you. 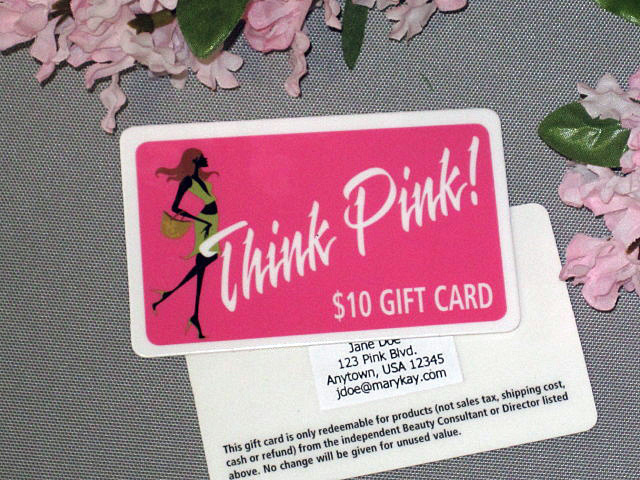 Here is a $10 Gift Card you can use toward your initial purchase. Call me to set up your FREE facial." Consultant Challenges - Include in your new recruit packages with the challenge of passing out five cards their first week. Customer Referrals - Give a good customer five Gift Cards and tell her to keep one for herself and give the other four to friends who are not MK customers.